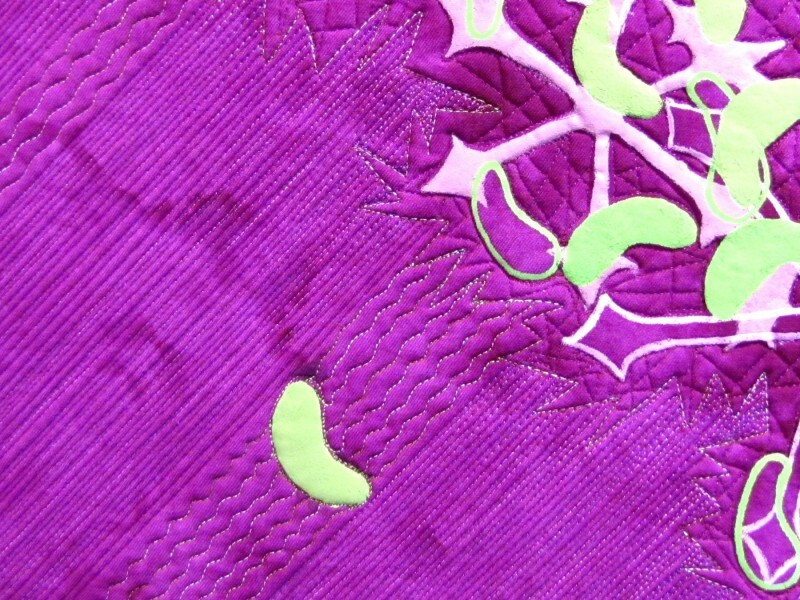 This is a detail shot of Complementary Samaras II, which I quilted in the above videos. Notice how the quilting stitches send the hand-dyed fabric into the background and appear to lie beneath the printed shapes. I love the layering possibilities this technique provides. To see the whole piece, go to Complementary Samaras II. Wow… you are great with that machine!! I really enjoyed watching these videos and hope to meet you at the SAQA conference in 214 also.. as Charlotte above says. Hi Donalee! Maybe I will see you at the DC conference this month. So happy to have found your website and love your videos. Also enjoyed meeting and visiting with you at the SAQA conference. I love your videos. I have always wondered how a quilting machine worked. although I have seen several machines, I have never watched them at work. I do a lot of embroidered quilts and I would love to have a quilting machine,but do not have room for one, so I have to sent my quilts out to be quilted. I plan on attending some or all of your shows. Thanks for the mail info,I never heard of your business before. I am so glad you like the videos, Eleanor. I hope to see you at some of the upcoming parties. Thanks!